When most people think of a retaining wall they think of a large wall holding back a lot of earth. While this is the purpose of a retaining wall, we like to think of it a little differently. 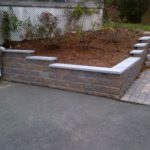 To us, a retaining wall is a way to create more functional space in your yard. 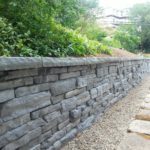 Whether it is in your back yard, along your driveway, or in front of your house along the street, a retaining wall allows you to get the most use out of the space you have. If you are building a house or buying a house with a sloping yard, a retaining wall is the perfect solution to creating a flat and more usable space. Do I need a building permit for creation go my retaining wall? 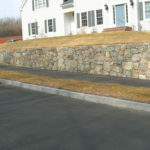 The Code of Massachusetts Regulations states that a permit is required for all retaining walls over 4 feet in height. The height of a wall is measured from the bottom course of wall block to the finished height of the wall. 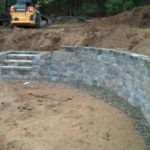 What is the process of designing and building my custom retaining wall? 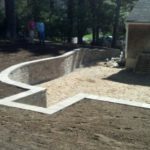 The first step in designing and building your custom retaining wall is to do a free on-site consultation. 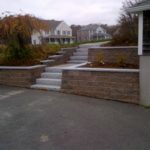 We will go over the general design you want for your retaining wall and how a retaining wall will enhance your yard. After taking extensive measurements and getting an idea of what materials you would like to use we can then give you an estimate on the cost of your new wall. If the height of the wall requires an engineer to create a plan, this will need to be completed before we proceed with the selection of material and a final design. After we have the material selected and a definite design, we will mark out the site ahead of time. The next step is to install the wall according to specifications and do a final clean up before we leave your site. Commercial retaining walls are usually larger scale and always designed by an engineer/architect. 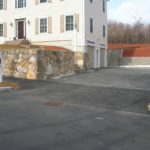 We will often use much different wall blocks in a commercial application than in someone’s backyard. These projects require larger machinery and this is something we are uniquely qualified to handle, as we own 2 full size excavators and tri-axle trucks. 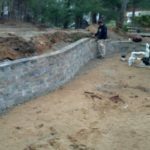 Residential retaining walls are usually smaller scale than commercial projects and are designed to create more functional yard space. 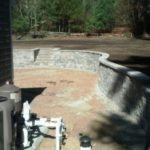 A residential retaining wall can be used to create a raised patio or push back a hill in order to create a larger living space. 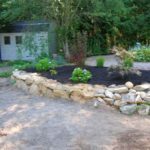 When planning any retaining wall, looking at the area surrounding the wall and how you can enhance that space is the key to creating a better living space versus simply building a wall. 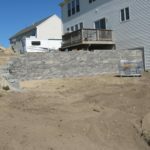 Contact Sheridan Landscaping for a free estimate on our commercial and residential retaining wall design and installation at (774) 413-5012 or fill our contact form to get immediate assistance.